Herniation of the cervical discs is a common injury to the neck. It primarily affects people between the ages of 30 to 50 and commonly causes pain in the neck region as well as pain and sensation changes into one or both arms. It can also cause muscle weakness and loss of function in the arms. How does a herniated cervical disc occur? Between each vertebral bone in your neck there is an intervertebral disc. The Intervertebral disc acts to cushion the spine and allow free and smooth movement. The intervertebral discs are structured a little like a jelly doughnut, with a central jelly-like area (the nucleus) and an outer fibrous layer (the annulus). Over time, microscopic tears can occur in the outer layer, which gradually worsen until the structure tears right through; allowing the inner gel to bulge out. The pain that occurs is mainly due to a large release of inflammatory chemicals in the injured region. The herniated disc can also put pressure on the nerve roots as they leave from the spinal cord through the intervertebral canal. In the neck region, these nerves then travel primarily to your arms – carrying down messages to move arm muscles and carrying back information about sensation (touch, temperature, pain etc.) If these nerve roots are squashed by the bulging disc, then muscle weakness in your arms, as well as arm pain, pins and needles or numbness may occur. How can you treat a herniated cervical disc? In the majority of cases, the symptoms from a mild cervical disc herniation will improve on their own over the course of 6 to 8 weeks. For some people the symptoms will be more persistent. It is really important to keep your neck moving so that stiffness and secondary problems do not occur. Many people have found that manual therapy (physical therapy) to be of help in both relieving their pain and helping to regain normal movement. This treatment may consist of gentle mobilization of your cervical spine, specific exercises and various modalities aimed at decreasing the pain and increasing movement. Your doctor may also prescribe pain relief or anti-inflammatory medication. In a small group of people, the symptoms do not settle with conservative measures or time. In this group, particularly if there is persistent pain or weakness into the arms, then surgery may be advised. Surgery is nearly always aimed at relieving the arm symptoms and taking the pressure off the nerve root. 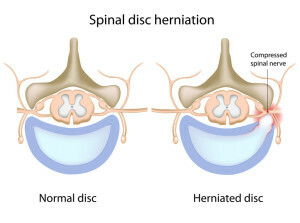 There are many different types of surgical techniques involved in surgery for cervical disc herniation – your surgeon will discuss with you the technique that is most suitable for you. Recent technological improvements in spinal surgery have led to surgery for cervical disc herniation being much less invasive than previously. Most patients enjoy a quite rapid recovery time and, after rehab, can resume their previous activities.